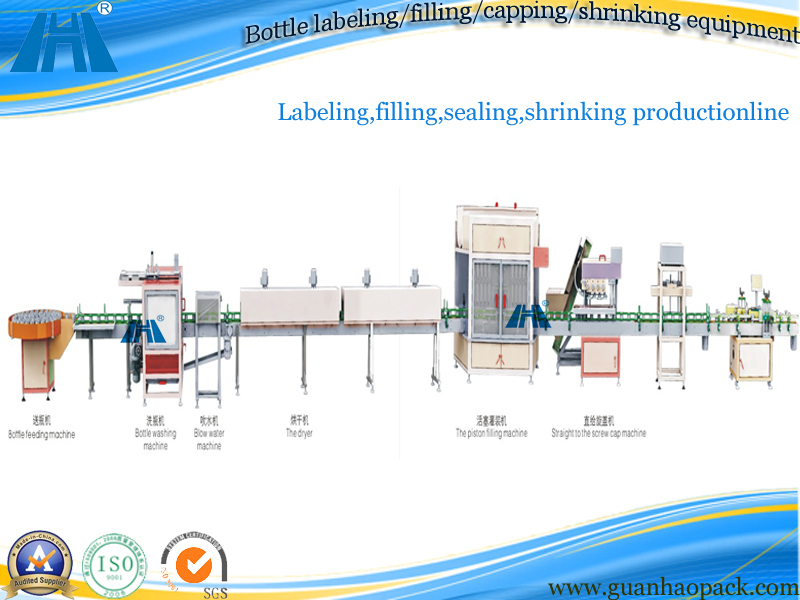 This line with both feeding machines,bottle washing machine,dryer,drying machine,filling machine,lamp check box,capping machine,shrinking machine,self-adhesive labeling machine automatic production line. Filling machine adopts imported specificate PVC tube,no plastizer,suited for filling wine,water,oil,milk,cleaner and other flow material. Fully comply with the requirement of GMP certificate is widely used in medicine,food,chemical industry etc. Machine made of corrosion resistant stainless steel production,convenient cleaning and disinfection,in accordance with the relevant provisions of the state food machinery.food hygience and requirements. The machine adopts imported infrared sensor,accuracy location control. Use imported PLC and 7 inch touch screen ,man-machine interface,simple control. With height adjusting hand wheel,It's easy to adjusted the nozzle filling height,in order to suited for different of specificate products. The organic glass cover design,to prevent impurities entering the filling materials,safety and healthy.